Passengers on the Sydenham, Ballarat and Bendigo lines can breathe a sigh of relief: the two-week shutdown is over, and their trains are back. All things considered it seems to have gone fairly smoothly, with plenty of staff on the ground, plenty of buses, and strong efforts made to get them through the traffic without too many delays. 1. Metro repeatedly ran ads with misleading headings, with some passengers seeing the above dates in MX and assuming the shutdown continued until this Thursday 21st. 2. Screens at CBD stations for the Sydenham line were often found blank. 3. Others advertised trains for Flemington Races, without advising who should use them (though announcements were generally made). 4. 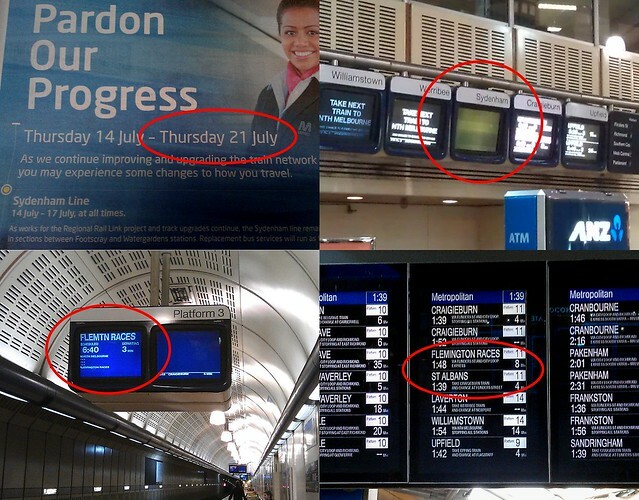 At Southern Cross (a repeat offender when it comes to incorrect screens and signage) they advertised trains to Flemington and had a screen referring to the St Albans Line. (It’s been called the Sydenham Line since the extension opened in 2002). PT Problem of the Day: Do you want a #Myki receipt? “No” means one; “Yes” means two.